Live Caribbean Stud poker takes many of the ingredients that make poker such a popular game, adding a few exciting twists of its own and shaking well to combine in a Caribbean Casino cocktail. Unlike standard poker games, this unique and exciting Casino classic sees you facing off against only the dealer – no worries about battling any of the other players with aggressive raises and range calculations! There is no bluffing required, so don't worry about bringing your ‘poker face' to the table. In fact, Caribbean Stud Poker is one of the easiest online Casino games to play once you have a grasp on the ranking of poker hands. Plus, it gives you the opportunity to play for some big prizes with simple and exciting side bets. If you are looking for some quick, simple action then Live Caribbean Stud Poker is the game for you. Pull up your chair and take a seat at one of the many live tables at PokerStars Casino to get started. Each player at the table, along with the dealer, is dealt five cards. With the dealer needing at least an Ace-King high to qualify, you don't need to be a poker whizz to get involved in the hand and enjoy the thrill of Casino poker action. The 5+1 Bonus Bet offers you more ways to win and even better chances of doing so – provided you learn how to play your cards right. To win, you simply need to make a five-card poker hand of at least Three-of-a-Kind or better using any combination of your five cards plus the dealer's face-up card. Live Caribbean Stud Poker is a popular poker variant that most Casino players will already be familiar with. There are no community cards or any other complicated extras; what you see is what you get – no draws and no bluffs. The goal of Caribbean Stud Poker is to beat the dealer's hand by making a better five-card poker hand. Like most poker games, Caribbean Stud Poker is played with a standard 52-card deck which is shuffled after every hand. Since you only take on the dealer instead of having to worry about the other players, when it comes to your five-card Caribbean Stud Poker hand, what you see is exactly what you get! Time to play, then. Step one is placing an initial bet (your Ante Bet) before any cards are dealt. You can play Caribbean Stud Poker at a wide range of stakes at PokerStars Casino, so once you have decided how much you want to bet and placed your Ante Bet you now have to choose whether or not you will play for the 5+1 Bonus Bet. Note: you must have placed an Ante Bet in order to wager on the 5+1 Bonus bet. All done? The dealer will then announce "no more bets" and the cards will be dealt. The action begins with the dealer dealing five face-up cards to you and then five to their own hands – one will be face-up, but the other four will remain a mystery. Now, based on your five-card hand and the dealer's one visible card, you must decide whether to call or fold. If you don't like the look of your hand, you can fold and end the hand, forfeiting your Ante Bet. Your 5+1 Bonus Bet will remain in play, though. However if you're liking how this hand is shaping up then hit 'call' to continue. Your Call Bet will be double the size of your Ante Bet. The dealer will then flip over their hand and the best five-card poker hand will win. The dealer must have at least Ace-King high to qualify; if they do not have at least that hand then you will win automatically. Of course, even if you get unlucky then you can always win with your 5+1 Bonus Bet according to the pay-out table. Royal Flush: the best hand in poker, this is an Ace, King, Queen, Jack and a Ten all of the same suit. Straight Flush: similar to a Royal Flush, this hand contains five cards in sequence, all of the same suit. The winner of two straight flushes is determined by the highest-ranking card; a hand of 9s-8s-7s-6s-5s will beat 7d-6d-5d-4d-3d. Four-of-a-Kind: this is a powerful hand that contains four cards of equal rank, with four aces being the best Four-of-a-Kind combination. Full House: this hand contains three matching cards of one rank and two matching cards of another rank. Two full houses are compared with the highest three ranking cards as the winner. For example, K-K-K-2-2 will beat a J-J-J-A-A, but not A-A-A-3-3. Flush: this is a hand in which all five cards are of the same suit, but not in sequence. Two flushes are compared by the highest-ranking card. If both hands have the same highest-ranking card, then the second highest ranking card is compared and so on until there is a difference. A flush of K-Q-9-5-4 beats a flush of K-Q-9-4-3. Straight: this hand that contains five cards in sequence, but in different suits. Two straights are compared by the highest-ranking card of each, so K-Q-J-T-9 will beat 9-8-7-6-5. Three-of-a-Kind: this hand that contains three cards of equal rank but no accompanying pair, unlike a Full House. Two Pair: this hand contains two matching cards of one rank and two matching cards of another rank. To determine the winner between two Two Pairs, the highest-ranking pairs are compared. If these are the same, the lower-ranking cards are compared – for example, A-A-9-9-4 will beat A-A-6-6-2. The fifth, unpaired card is called the 'kicker' and is used to determine the winner between identical Two Pair hands. This means that K-K-Q-Q-8 will beat K-K-Q-Q-5. Pair: this is a hand that contains two cards of equal rank. The remaining cards are used only to determine a winner between matching pairs; this means that 7-7-5-3-2 will beat 7-7-4-3-2. High Card: this is a hand that does not meet any of the above requirements. Essentially, no hand is made, and the only thing of meaning is the highest ranked card. These hands are named after the high cards – A-J-7-4-2 is "Ace high" or "Ace-Jack high". The dealer must have at least an Ace-King high to qualify. This means their hand must contain at least an Ace and a King. If the dealer does not qualify, you will win even money (1:1) on your Ante Bet and your Call Bet will be returned to you. If the dealer qualifies and you do not beat the dealer's hand, you will lose both your Ante Bet and the Call Bet. If you and the dealer tie, the Ante Bet and Call Bet are both returned to you. The theoretical Return to Player (RTP) in Live Caribbean Stud Poker is 98.19%. The theoretical Return to Player (RTP) of the 5+1 Bonus bet is 91.44%. 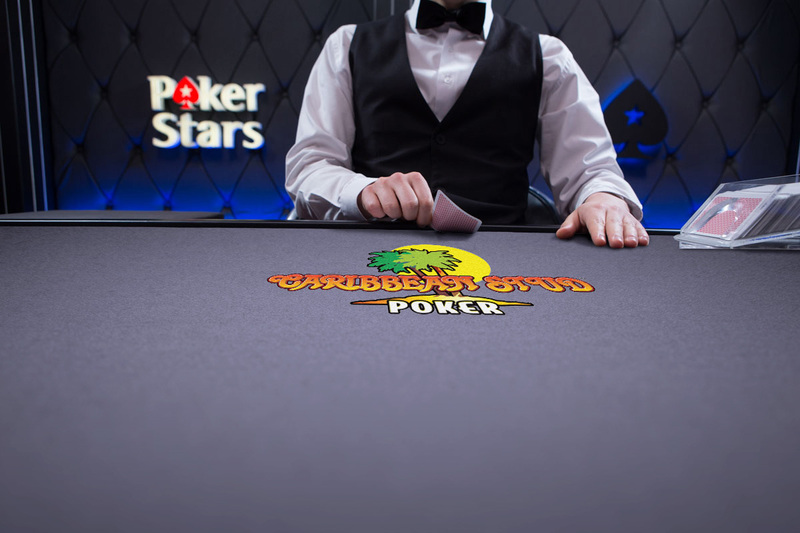 What makes Live Caribbean Stud Poker so much more exciting than a traditional poker game is that PokerStars Casino gives you a live dealer to handle all of the action. The dealer will greet you when you take your seat at the table and will be able to answer any questions you may have. You can interact with the dealers by sending chat messages and then watch them respond in real time. Caribbean Stud Poker is available 24 hours a day and can be accessed via the Casino tab on your desktop client. You can also play Live Caribbean Stud Poker games on your iOS or Android phone or tablet. For more detailed information on how to play Caribbean Stud Poker, visit our Live Caribbean Stud Poker rules page.